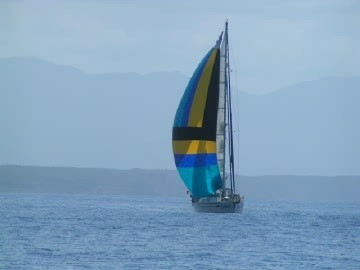 A great sailing adventure in the Caribbean in Garifuna Land. To order the DVD movie, go to the bottom of the page!
" Nicole and Louis wanted to make a film about our adventure. 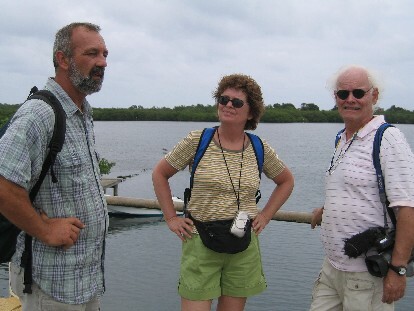 They came to join us in the Bay Islands in Honduras, in the Caribbean Sea, and they stayed with us 15 days. 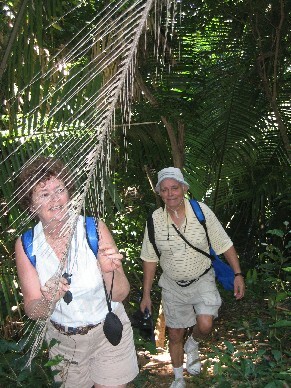 We visited the islands of : Roatan, Guanaja, Los Cochinos, West-End, Utila, and eventually, La Ceiba on the continent"
Marianne and Gaetan, a wonderful team for our shooting. Shot taken from the film. Two wonderful weeks, ... A great film !
" 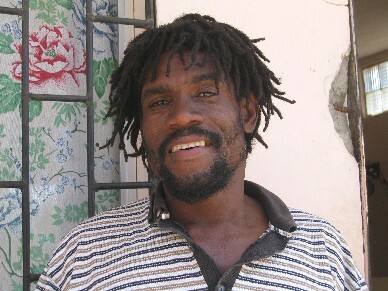 Alegria 11 in Garifuna land"
The population of the Bay Islands are isolated about 30 miles away from the Honduran continent. 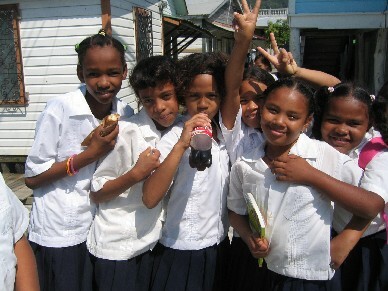 The Garifunas represent a great part of the population. These people came from Africa. They came with all the others. A film by Louis Charbonneau. 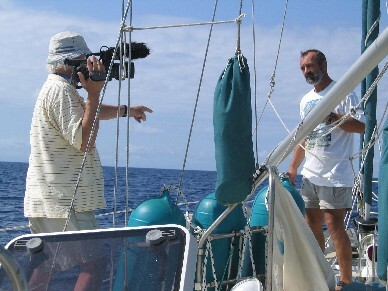 A documentary on the life of Marianne and Gaetan aboard their sail boat. A small opening on their great sailing story around the world. 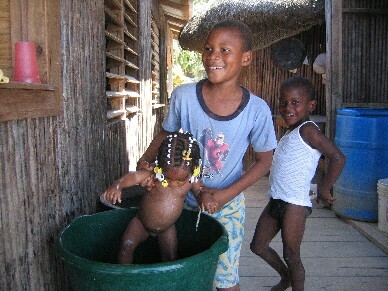 Nicole and Louis joined them in the Bay Islands in Honduras, in the Caribbean Sea. Marvellous shots of Marianne and Gaetan on their beautifull sail boat, Alegria 2, sailing around the islands Roatan, Guanaja, Los Cochinos, West-End and Utila, discovering the surroundings, meeting new people, finding new cultures, new music,... This sailing adventure will feed your dreams of great departures. ... an adventure quest... an adventure at sea ! Marianne:" We needed a change in a sense, we both worked very hard, our jobs were very important, and what we wanted was a change in our life, more time together, a better quality of life. We already had a boat and it was on the boat, that we felt close to each other when we were doing things together, that we were at our best and very happy. So we decided we would spend all our time on a boat. " Always focussing on the construction of the boat "
But in the long run, what we leave behind, it is not evident to realize until we start living the new life punctually"
Gaetan : " To discover new cultures, new food,... It's really interesting... people, here, take the time to live... It's different from our north American way of life, running all the time and not taking time to enjoy and to share with others." Marianne : "Our new way of life is more human, more punctual... Here, we're not always running. When I say here... it's true for most places that we visited until now. " Other ways of sailing around. The cayocos, ... Very tender! Worst than a canoe. Shot taken from the film. 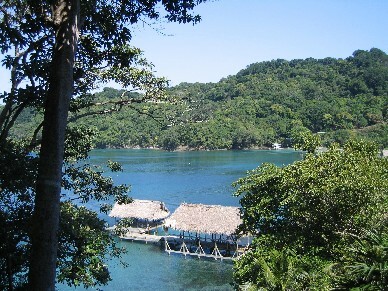 The cayocos are small boats made with the trunks of the local trees. They have a lifespan, of about five years. Sometimes we see them with sails made of all kinds of materials, plastic, old fabrics.... Sometimes, they don't have sails at all. They go far out on these small boats, it's surprising. They don't have a keel, they have a rudder, astern, and it's the skipper and his ability of holding the balance that keeps it afloat. it's probably because of our way of life. The gatherings are true and authentic." Marianne : "After these two intensive weeks with our friends, Louis and Nicole... are leaving us. They have a Big bundle full of movie shots. As for us, it's back to our adventure, following the wind "
But they all have the same curiosity. We like to visit the small schools. The children almost always have a uniform, they are well dressed ... The teachers are almost always in connivance with them to get them interested in our visit... And it's so nice to meet these children."